Earth-sheltered homes are resistant to extreme temperature fluctuations because they're covered with a thick layer of sod. That's particularly important in central California, where daytime temperatures in the summer are often over 100 degrees. 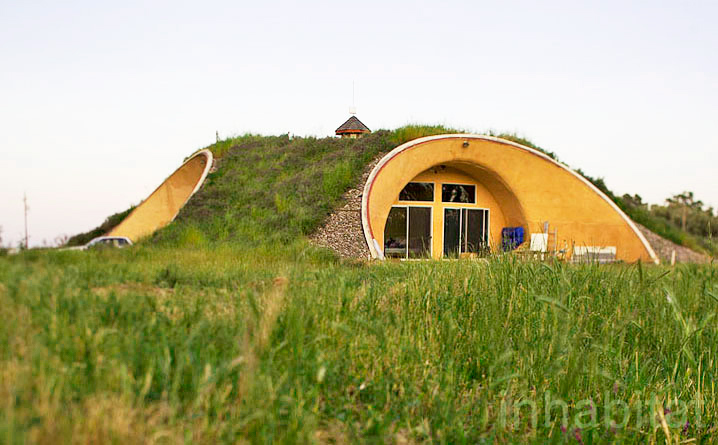 So Nigel and Lorraine Walker, owners of Eatwell Farm in Dixon, CA, decided to build an earth-covered farmhouse. The couple bought a kit from Formworks Building, a Colorado-based company that specializes in energy-efficient structures, and built their dream house themselves. 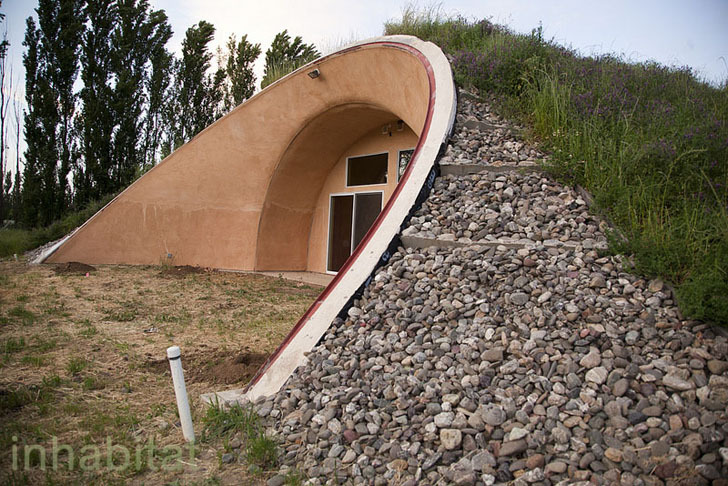 Earth-bermed homes are found throughout the hills of Northern California, but they’re much less common in the flat farmland of the Central Valley. So it’s somewhat surprising to see the Walkers’ dome-shaped home poking out next to a small pile of hay bales on their organic CSA farm. The home is much more energy efficient than a typical frame house, and because it’s covered in plants, it doesn’t require much in the way of exterior maintenance, except maybe for occasional trimming. Formworks Building is a Durango, CO-based company that designs eco-friendly homes and structures around the country. 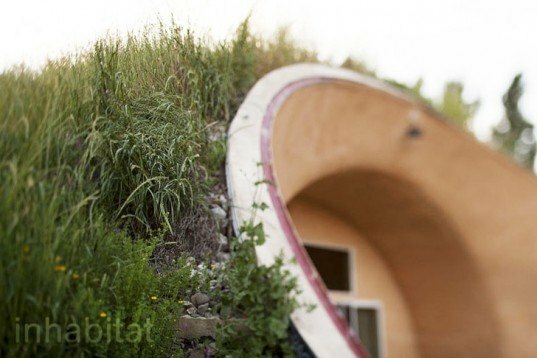 The company claims to have built more earth-sheltered homes than any other builder in the world. Formworks sells kits of structural components that can be erected and completed without any previous building experience. “This system was designed to be built by anyone, anywhere in the world,” the company explains on its website. The homes are much more energy efficient and durable than a typical house, and they cost about as much to build as a wood frame house. First, the concrete foundation was poured, which contains the home’s utility lines. Above that, a large skeleton of rebar and mesh was erected, which was then filled with concrete. Then, sod was added to the roof, and any non-vegetated areas were covered with stucco. And finally, plants were seeded on the roof and the interior spaces were finished. The Walkers discovered Formworks on Google, and they visited Durango to meet with the company’s designers. They were able to completely customize their home, designing a large dome-shaped structure with four large openings for windows and doors. The interior features soaring, dome-shaped ceilings, and there are loft spaces that can be used for additional storage or sleeping space. Lorraine specified that she wanted a large kitchen, and she got her wish: The industrial-size kitchen takes up nearly half of the common area. The roof is set at a gentle enough pitch that it’s possible to walk right up to the top. A thick layer of soil covers the roof, which has been planted with a meadow of tall grasses and wildflowers. At the top of the dome, small cupola peeks out above the grasses, providing an extra bit of sunlight to the home. My mother lived in a turf house on til she was 15. And was so glad to get out of it and in to a well lite house. That she talked offen abut the experience. 1100 years was to long, and thoe some have a romantic opinion to day. The people that lived in them hade frosen coredors and dimolishd them fast. The only ones surviving where the best and the bigest houses. http://www.topstravel.net/traditional-turf-houses-in-iceland/ Have a lovely day full of sunshine. Matthild. Hi.I'm very interested in your structures and what price ranges and models are available? I live in upstate NY, near lake Ontario. Residential and farming community. Will have to check out your website, but if there is anything anyone can tell me, pass it on please. Earth-bermed homes are found throughout the hills of Northern California, but they're much less common in the flat farmland of the Central Valley. So it's somewhat surprising to see the Walkers' dome-shaped home poking out next to a small pile of hay bales on their organic CSA farm. The home is much more energy efficient than a typical frame house, and because it's covered in plants, it doesn't require much in the way of exterior maintenance, except maybe for occasional trimming. Formworks Building is a Durango, CO-based company that designs eco-friendly homes and structures around the country. The company claims to have built more earth-sheltered homes than any other builder in the world. Formworks sells kits of structural components that can be erected and completed without any previous building experience. "This system was designed to be built by anyone, anywhere in the world," the company explains on its website. The homes are much more energy efficient and durable than a typical house, and they cost about as much to build as a wood frame house. First, the concrete foundation was poured, which contains the home's utility lines. Above that, a large skeleton of rebar and mesh was erected, which was then filled with concrete. Then, sod was added to the roof, and any non-vegetated areas were covered with stucco. And finally, plants were seeded on the roof and the interior spaces were finished. The Walkers discovered Formworks on Google, and they visited Durango to meet with the company's designers. They were able to completely customize their home, designing a large dome-shaped structure with four large openings for windows and doors. The interior features soaring, dome-shaped ceilings, and there are loft spaces that can be used for additional storage or sleeping space. Lorraine specified that she wanted a large kitchen, and she got her wish: The industrial-size kitchen takes up nearly half of the common area. The roof is set at a gentle enough pitch that it's possible to walk right up to the top. A thick layer of soil covers the roof, which has been planted with a meadow of tall grasses and wildflowers. At the top of the dome, small cupola peeks out above the grasses, providing an extra bit of sunlight to the home.